Surplus scenario emerges despite double digit growth in demand on accelerated capacity additions; seeks abatement of excise duty on cement, removal of customs duty on inputs. n the current fiscal, the prices have actually tumbled by steep Rs 22.60 between April 2009 and February 2010. Thus, although the demand has remained fairly strong in the recent past, accelerated pace of capacity additions are set to dampen the capacity utilization and is also robbing the pricing power of the sector. Meanwhile, the input costs are rising. Australian thermal coal prices have surged by 34% to US$ 82 per tonne in December 2009 from Rs 61.00 in March 2009. Also, almost all the players have captive power plants, many of which are running on petroleum derivative based inputs. For Instance, furnace oil prices were 84% higher, Low Sulphur Heavy Stock (LSHS) was 75% higher in January 2010 on y-o-y basis. The spike in costs at a time when realisations are weaker, and higher costs associated with expanded capacities together prove lethal for the cement industry. The aggregate financials of 26 cement companies recorded 9% increase in sales to Rs 7982 crore, but their net profit fell by 16% to Rs 731 crore, primarily due to 150 basis points fall in margins to 23.9% in the quarter ended December 2009. Excess capacity is rampant in Southern region, which is also impacted by weaker demand in select states like Andhra Pradesh. As a result, the aggregate of 12 south based cement companies recorded steep 84% fall in net profit to mere Rs 36 crore, despite 9% increase in sales to Rs 2663 crore, primarily due to 890 basis points fall in margins to 17.7% during this period. But the silver lining is the strong demand growth. As per data from the Office of the Economic Advisor to Ministry of Commerce & Industry, Indian Cement production recorded impressive 11.0% growth to 150.13 million tonne in the nine months ended December 2009. With economic growth expected to improve, and as key user industries like real estate, construction, infrastructure etc are witnessing acceleration in the pace of growth, there is no dearth of demand growth for cement sector, which can continue to grow in double digits. Only, the capacity additions are happening at a faster pace, and hence the emerging surplus scenario in cement sector is set to last for next 18 to 24 months. The Working Group on Cement Industry for the XI Five Year Plan (2007-12) had set a target of cement production at 269 million metric tonnes and the capacity needed at 298 million metric tonnes at the end of the Plan i.e. 2011-12. The Industry has already added over 66 million metric tonnes of capacity in the first two-and-a-half years and another 50-60 million metric tonnes is in the pipeline to be added in the remaining period of the XI Plan, to achieve the set targets. Cement is a highly taxed commodity among the essential infrastructure input basket. The total government levies and taxes on cement constitute 60% or more of the ex-factory price. Thus in a scenario where the margins are being squeezed due to lower pricing power and higher input cost, the industry expects rationalization of the existing tax structures besides various other measures in order to maintain its efficiency and competitiveness. Some of the measure suggested will remove the anomalies besides assisting incremental demand growth. Cement still remains the highest taxed essential infrastructure input in India. Various Government levies and taxes, taken together, constitute over 60% or more of the ex-factory price. Imposition of import duty on cement as well as abatement on excise duty levied on the MRP with uniform rate of lower excise duty is important for continuing the growth momentum of the industry, besides providing impetus for other related industry like infrastructure. As against the complex excise structure currently prevailing (see table current duty structure), the cement industry desires a uniform rate of excise duty to be levied on cement. 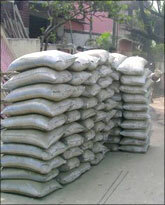 Besides, the industry also expects an abatement of 55% for cement in line with the suggestion made by NCAER. Whenever Excise Duty is levied on the basis of MRP, Abatement is given. However, no Abatement has been given to OPC, PPC and Slag Cements, though Excise Duty is levied on the basis of MRP. Coal, PET Coke and Gypsum besides fly ash are some of the major input requirements for manufacturing cement. Besides, the industry has to rely heavily on imports due to inadequate domestic availability of these products. Currently PET coke, coal and Gypsum attract an import duty of 5% whereas the finished cement attracts zero import duty. Thus in order to correct the anomaly the cement industry wants the import duty on important inputs like coal, PET Coke, and Gypsum to be abolished in line with established principle that import duty on inputs should not be higher than on finished products. According to the working group report for the cement industry for the current five-year plan (2007-12), the coal requirement will increase by 70 per cent to 58 million tonne in 2011-12 from 35 million tonne in 2007-08. Last year, imported coal prices had reached as high as $180 a tonne. Currently, the international coal prices are trading close to $90 a tonne. The industry also demands the VAT rate on cement to be brought down to 4% in line with similar important construction material like Steel. The current rate of VAT on cement is 12.5%. Further the industry expects cement to be included in the "Declared Goods" just like steel. The industry seeks the royalty paid on Limestone to be allowed as credit  either as Cenvat credit or as VAT credit. Also the duty/cess being levied and collected on indigenous coal should also be allowed as VAT or Cenvat credit. Royalty on limestone is one of the levies for which credit is not allowed at present. This results in cascading effect as various taxes get levied on this element also at every stage and as a result, the ultimate burden of taxes is increased. This leads to higher costs. The cement sector is set to continue with excess capacity over the next 18 to 24 months. Although the measure suggested by the industry body may improve the operating environment in the short to medium term; in the long-term new demand drivers needs to be created. The economic stimulus withdrawal has to be calibrated to ensure that there is no adverse impact of the same on the demand. Also, government is set to lay greater emphasis on infrastructure, which augurs well for the cement sector. While demand side positives are set to come, the industry is worried about likely changes in duty structure (read hike in excise duties), which can be detrimental. Also, the abatement on excise duty is a legitimate expectation, which needs to be allowed. On overall basis the budget is likely to be neutral for the industry. The demand outlook remains strong in the medium term primarily driven by the revamping urban construction and real estate activity. Despite this, the sector is likely to be in excess supply zone upto a couple of years. While abatement on excise duty will be a big positive, greater thrust on infrastructure investments will cement the demand growth prospects too. But partial / full exit of the economic stimulus, especially any increase in excise duty is set to be negative for the Indian industry in general and cement sector in particular.